If you’re suffering from decayed, broken or missing teeth, you understand the toll it can take on not just your smile, but on your confidence and overall quality of life. You probably also know that these problems don’t just get better on their own, they will only get worse – more painful, more damaging, and more costly – down the road if left untreated. Thankfully, your Diamond Valley Dentist has the advanced training and technology to repair and replace teeth with the most modern, durable, and aesthetic solutions. If we’ve found a cavity, don’t panic. We’re all human, and sometimes these things happen. We can quickly and easily take care of it for you with a durable and natural looking tooth-colored filling that blends in seamlessly with your smile. No toxic mercury, no ugly dark spots, and less removal of healthy tooth structure makes tooth-colored fillings as easy as pie. If you’re experiencing a toothache or you have an infected tooth, you may need a root canal to save it. We know root canals have earned a bad rap over the years, but rest assured, today they’re a pretty quick and easy procedure, and usually no more uncomfortable than having a cavity filled. Dr. Nathan Jergensen will provide a local anesthetic to make sure you are totally comfortable and don’t feel a thing. He will make a small access hole in the tooth, through which he will use specialized instruments to gently and carefully remove the infection. He will then sterilize and fill the chamber to prevent further infection, and seal the tooth with a crown to restore it to full health, function, and aesthetics. See, that wasn’t so bad. If you have a tooth that’s been broken or damaged by decay and is past the point of repair with a simple filling, you may need a crown to bring it back to health. Crowns are tooth shaped caps designed to repair damaged teeth. The process begins with impressions that will be sent to our lab to have your restoration created. We will then prepare the tooth for the crown by removing any decayed or damaged tooth structure, and place a temporary crown for you to wear while your final crown is being made. When you return, we will remove the temporary, place the final crown, and make sure it fits just right. Voila! Now you can eat your favorite foods and smile with confidence again, knowing your healthy tooth root is secure and protected. If you’re missing a tooth or multiple teeth, it can be hard to live your daily life and feel confident. Not to mention the damage occurring below the surface to your jawbone, and the shifting of other teeth to fill the space. With missing teeth, we will always recommend dental implants to replace the tooth root, which is essential for a healthy mouth and jawbone. If you’re not a candidate for or cannot afford dental implants, your next best option would be a fixed bridge secured with crowns on either side. 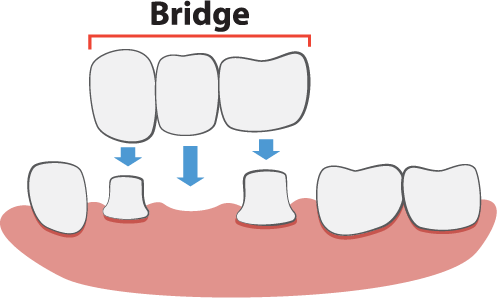 Bridges generally consist of one or more fabricated teeth to fill the gap, anchored with either crowns on either side or with dental implants. Bridges can restore balance, function, and aesthetics to your smile, restoring your confidence and quality of life. If you’re missing most or all of your natural teeth or living with old dentures that rock and slip, we would love to help you with our modern denture options. If you still have some healthy teeth remaining, we will try and conserve those for as long as possible. We can use remaining teeth as anchors for a beautifully secured partial denture. 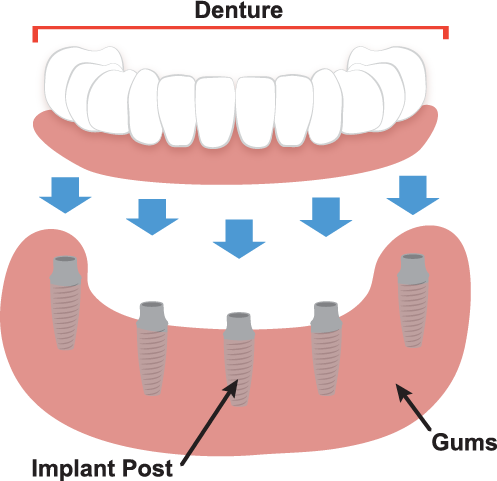 If you’re missing all of your teeth, we offer both traditional and implant supported dentures to suit your needs. We will always recommend dental implants where teeth are missing because they help secure the jawbone and lock teeth in place for the most life-like solution. Dr. Nathan Jergensen has the advanced training and technology to place implants right here in-house. If your mouth has been devastated by a traumatic injury, illness, infection, tooth decay, what have you, you may have lost all hope in ever having a healthy, functional smile again. Your Diamond Valley Dentist wants you to know you don’t have to suffer. Dr. Nathan Jergensen has the advanced training and technology to completely rebuild your smile from the ground up. First, you will sit down in a comprehensive consultation with the doctor to discuss things like your current state of oral health and how you got here, your overall medical history, as well as your goals, budget and ideal timeline. We will address any fears or concerns you have and make sure you are completely comfortable with your personalized treatment plan. We would love nothing more than to help you get your quality of life back with a functional, healthy, and beautiful smile that allows you to live your life to the fullest. “I’ve always been afraid of the dentist; and having past bad experiences didn’t help. But after being in pain, I called Ann and I reluctantly went in. I’m so glad I did!! The staff was/is amazing and Dr. Jergensen is the best!! Patient, understanding, and has a sense of humor. I now look forward to going to the dentist, am so glad I found them! Thank you Dr. Jergensen and staff!” – CJ D.
If you’re ready to restore your smile, your confidence, and your quality of life, we would love to help you. Contact your Hemet restorative dentist at Diamond Valley Dentist today by giving us a call at (951) 763-8862 or requesting an appointment online!